THERE is a "destabilising force" within the Government because Fine Gael politicians have not fully accepted last year’s general election result. That’s according to Fianna Fáil leader Micheál Martin who today accused ministers of being fixated with the issue of Taoiseach Enda Kenny’s leadership. Speaking to ‘The Morning Show’ on East Coast FM, Mr Martin warned the Government that it needs to “step up” and “improve its performance”. Mr Martin also rounded on FIne Gael, saying there is “too much angst” in the party over the leadership issue. “My own genuine sense since the Government was formed is there’s been too much internal angst within the Fine Gael party, that they’ve been very unsettled,” Mr Martin told broadcaster Declan Meehan. “They didn’t like the result of the General Election and I don’t think they’ve accepted it fully within themselves. There is a destabilising force in the Government since its exception,” he added. Mr Martin said Fine Gael politicians voted confidence in Mr Kenny’s leadership in the Dáil a few weeks ago - before later calling for him to lay out his exit strategy. He said ministers are constantly “jousting for profile” so that they appear in the following day’s newspaper. His remarks came as speculation continued within Fine Gael over when exactly Mr Kenny will step down. Housing Minister Simon Coveney - a frontrunner to succeed Mr Kenny - said he does not believe a motion of no-confidence will be tabled. Mr Coveney insisted "nothing has changed" since the Taoiseach's successful visit to the United States last week and stressed that Fine Gael is "relaxed and content" for Mr Kenny to be given time to put the leadership succession process in place. The Cork TD is now running neck-and-neck with Social Protection Minister Leo Varadkar in polls over who is best placed to succeed Mr Kenny. Mr Coveney has also backed a Fine Gael leadership race with multiple candidates to "showcase the talent within the party." Speaking in Cork where he announced 180 new jobs for Kings Laundry, Mr Coveney warned Fine Gael members there was no need for acrimony over the imminent leadership transition. But he warned anyone tabling a ' no confidence' motion in Mr Kenny will discover it will attract very little support within Fine Gael. "I think that is a non-issue - I don't think there is going to be a motion of no confidence." "I think if anybody were to put one forward it wouldn't be support by even a dozen people." "I don't think there will be a motion of no confidence - there is no need for one." 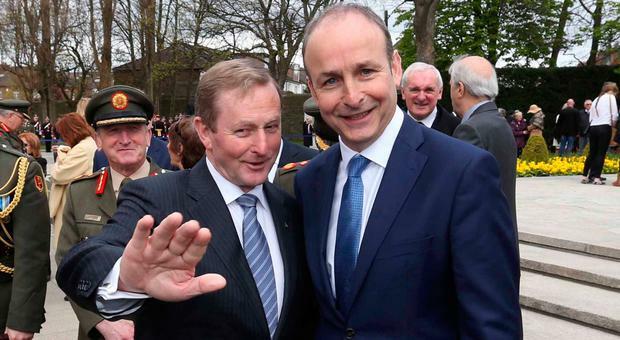 "The party is very united behind Enda Kenny and very supportive of him." Mr Coveney urged party members to be patient with Mr Kenny as he refused to speculate on when Mr Kenny will signal the end of his 15 years at the helm of Fine Gael. "I think people should show a little patience to allow that process to take its course." "The party trusts Enda Kenny to manage this - I think that process will be outlined sooner rather than later." "I don't think there is any need for rancour or acrimony in the build-up to it." Meanwhile, Fine Gael MEP Sean Kelly said he believes Mr Kenny will not delay his departure as Fine Gael leader - and could step down in May. Mr Kelly, who is a first cousin of the Taoiseach's wife, Fionnuala, said the Taoiseach is a keynote speaker at a conference of Fine Gael's EU umbrella body, the Christian Democrat EPP group. This takes place in Dublin on May 11 next. "It is my hope he will be in office until that conference at least. Then I believe sometime after that he will step down as leader of the party, sometime in May possibly," Mr Kelly, also a former GAA president, told independent.ie. Also speaking today, the party’s deputy leader and senator James Reilly said he expects a new Taoiseach to be in place by the summer.